Only one week after announcing her fourth marriage to Barry Herridge was over after just 16 days, it appears Irish singer Sinead O’Connor has changed her mind. Sinead O’Connor, 45, took to her newly re-opened Twitter account in the early hours of this morning to reveal she was reconciling with her husband Barry Herridge. In rather revealing messages, Sinead O’Connor said the couple had been “love-making”. 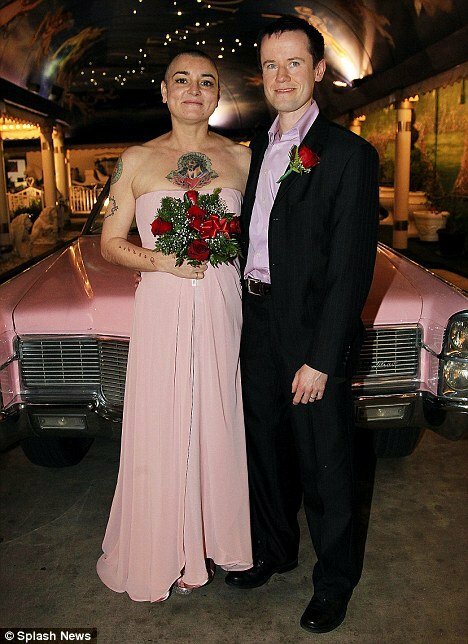 Admitting they rushed down the aisle following their Las Vegas nuptials on December 8 after just four months of dating, Sinead O’Connor explained they would be “boyfriend and girlfriend again” – despite still being legally wed. Under her Twitter handle “vampyahslayah”, Sinead O’Connor wrote: “Guess who had a mad love making affair with her own husband last night? Sinead O’Connor revealed the couple’s marriage had ended in a lengthy statement on her official website on Boxing Day. Initially, Sinead O’Connor blamed the “intense pressure” on the couple and admitted his friends and family were unhappy with the union. Clearly happy with her reignited lovelife, Sinead O’Connor later added on Twitter: “So Sinead got laid!! !… and all well. Barry Herridge is the latest husband in a list of short-lived marriages for Sinead O’Connor.